Genghis Khan (Tadanobu Asano) has a quiet moment in Mongol. Tadanobu Asano stars as the young Genghis Khan in this flawed, but consistently engrossing tale of the great conqueror’s rise to power. Nominated for an Academy Award for Best Foreign Language Film. Sergei Bodrov’s Academy Award-nominated film Mongol could easily be retitled The Man Who Would Be Khan. It isn't the story of Genghis Khan at the height of his power, but is instead an epic tale of his gradual ascendance from exceedingly humble beginnings. Early in the film, we are introduced to a nine-year-old Genghis-in-the-making, Temudgin (Odnyam Odsuren), who at even so young an age must continually suffer the proverbial slings and arrows of outrageous fortune. After going against conventional wisdom and picking a young bride (Bavertsetseg Erdenebat) from a lesser clan, Temudgin soon finds himself thrust into a life of hardship and humiliation. Eventually, Tadanobu Asano steps into the role of the mature Temudgin, who returns to the neighborhood after years on the run to reclaim his bride, Borte (played as an adult by Khulan Chuluun). The happy couple reunites with Temudgin’s family and all is well - for a while, anyway. Tthe honeymoon doesn’t last long, as the Khan of the rival Merkit tribe has decided to claim Borte as own. He succeeds in kidnapping her, and a wounded Temudgin is alarmed to discover that he will have to wait until the following year to mount a rescue attempt. Why so long? He can’t save her alone against the Merkits, and his blood brother, Jamukha (Sun Hong-Lei) will only assist Temudgin on this condition. Patience, it appears, is a virtue Temudgin will learn all too early. Thanks to a bloody, impressively-filmed raid, Borte and Temudgin are eventually reunited, but this time, they’re joined by a child of, well, somewhat questionable parentage. No matter. Temudgin immediately accepts the boy as his son. Things seem to be looking up for our hero – not only has he reunited with his wife and gained a son, but he’s also earned the loyalty of some of Jamukha’s men, who are all too happy to jump ship from their old crew and serve their new benefactor. Of course, this unexpected defection to Temudgin’s posse causes the initial cracks in his friendship with Jamukha. As we will be continually reminded in this film, states of peace are fleeting. Through another series of torturous events, Temudgin eventually finds himself sold into slavery, carted off to the faraway land of China, and imprisoned in a fairly humiliating way by a Chinese official. No walls could ever hold the future Genghis Khan, right? Well, to be fair, his wife does have something to do with his inevitable escape. Free at last, Temudgin once again returns to his homeland, but this time around, he’s got an agenda. “Mongols need laws. I will make them obey,” Temudgin declares, “even if I have to kill half of them.” Clearly, it’s “go time” for Genghis. 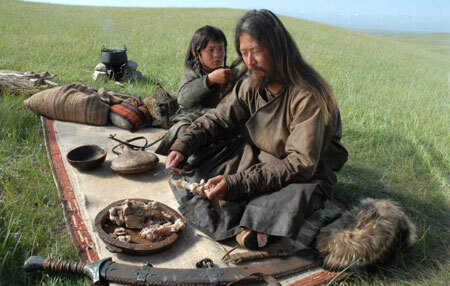 Academy Award nominee status notwithstanding, Mongol is far from a perfect film. Compression is one issue. I’m aware that no man’s life – even a sizeable chunk of it – can adequately be compressed to fit a two-hour running time, but my issue has more to do with what events the filmmakers choose to compress and how they went about doing so. Mongol is an odd film in that it often focuses its attention on moments one wouldn’t necessarily expect, while at the same time glossing over those moments you’d think were required viewing. For instance, there’s scene in which an apparently clairvoyant Buddhist monk advises a Chinese official against enslaving Temudgin for fear that the Mongol is destined to overthrow China. It’s a nice setup, if a little too heavy-handed, but strangely enough, it gets paid off not in a triumphant reversal scene later in the film, but in the form of a line of text in the closing moments of the picture. Do we really need to see that scene? Not necessarily, but it would certainly help bring things full circle in a bold way. As the saying goes: show, don’t tell! Of course, I wouldn’t want the filmmakers to sacrifice all that crucial character stuff at the risk of being too conventional. However, it would’ve also been helpful if the film had actually fleshed out the things it tended to ignore (especially Temudgin’s militaristic side) not only to demonstrate his prowess as a superb fighter and a brave leader to the audience, but also to help reinforce his later triumphs on the field of battle. Sometimes, it seemed as if Temudgin was “great” only because that’s what it says in the script. And what about those battles? After Braveheart, Return of the King, and 300, the bar has been set pretty high in terms of filming epic battle scenes. And if one or all of those films fit your criteria for a good epic, well, Mongol may not exactly impress. And when they do focus on the battle, sometimes it just doesn’t work. To tell the truth, the “secret weapon” that turns the tide in the final battle is executed in a fairly silly way, even if the veracity of the event is supported by historical record. It also doesn’t help that viewers will discover in the final reel that they’ve essentially been watching one very long first act. Reports suggest that Mongol is only the first part of a trilogy, but on its own merits, it’s not quite as satisfying as it should be. But despite all the (possibly misguided) complaining on my part, I should emphasize that Mongol is by no means a bad film. In fact, it’s quite good. It certainly looks pretty. The natural landscapes of Mongolia and Kazakhstan are creatively used to give the film that required epic scope, as the panoramic views belie the film’s relatively low budget. But it’s not only the sweeping vistas that impress, but also the creative camerawork. One moment that stands out is a series of POV shots from Temudgin’s perspective in which our exhausted hero flails his sword at any enemy in his path. It’s an immersive moment that takes video game aesthetics (first-person shooters) and successfully adapts them to the realm of film. But it’s not all pretty pictures. Mongol has a stellar cast, to be sure. Tadanobu Asano makes a hell of a Genghis Khan. His character is the typical strong, silent type, and Asano makes it all look so effortless, even successfully imbuing the character with a bit of humor from time to time. His character’s devotion to Borte is the crux of the film. Despite the bloody battles, this film was clearly made to show the softer side of Genghis Khan. It’s a valid choice, but oddly enough, it doesn’t adequately prepare viewers for the kind of devotion that Genghis Khan will inspire. In Mongol, Genghis Khan is your typical “nice guy,” who loves his wife and is always willing to give his soldiers a square deal. That’s a refreshing change of pace from other depictions, but even with all the hacking and slashing, the more intimidating barbarian side of Khan seems to be downplayed far too much. Acting-wise, it’s good that Asano has plenty of support from his fellow castmates. His character is so stoic that it’s essential that he have a foil to play against. Luckily, that foil is Sun Hong-Lei, who nearly steals the show as Jamukha, the friend-turned-enemy (aka “Frenemy”) of Temudgin. His allegiance switch isn’t some dramatic turn to the dark side, but something far more nuanced and believable, as he still possesses a grudging respect for his newfound nemesis. In any other movie, the role of Borte would likely be a thankless one, as women are often relegated to the background in many an epic. But in Mongol,, we find a female character who has her own story as well, one of plucky perseverance and undying love for her significant other. Truth be told, Tammy Wynette has nothing on Borte, as the latter takes the phrase, “stand by your man” to the extreme, even going so far to traverse the continent and sell her body just to save her dear Temudgin. While pretty in her own way, Khulan Chuluun’s lack of movie star good looks helps sell the verisimilitude of the film. However, it’s her understated acting style that clinches the deal.